Petar loves music, and his violin keeps the whole village dancing. But when war breaks out, Petar, his mother and his brother have to leave the valley and flee across the border to safety, leaving their beloved father in the village with the other men. 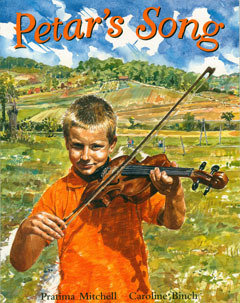 Petar's Song is a glorious tale of hope and community spirit. Petar's Song by Pratima Mitchell & Caroline Binch is available to buy now.